7:00AM We spotted all four fledglings roosting close together (three of them were clumped side by side, actually touching), about 70 feet up in the hackberry just southwest of their nest tree. At least one parent is attending, 3 feet away. We were surprised that last night’s fledgling (#4) was already able to join the family group so high in the canopy. The fledglings are congregated around an abandoned squirrel nest, which might provide both a visual screen and a comfortingly solid mass. 7:30P, The owlets are up by the squirrels’ nest but show signs of restlessness. (photo). F owl is in the usual roost behind the nestbox, underneath the owlets. Dad is up there keeping order. 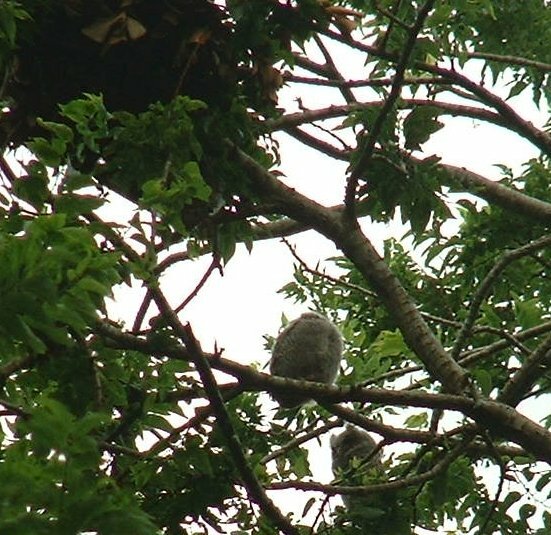 9PM, The owlets have moved down to an upper Driveway branch are receiving food items from both parents. We can track their movements by their feeding rasps. The male hooted and clapped when T and C walked down the driveway, so we went back inside. The fledglings are getting good with their wings and short flights, though the landings need practice.